Old School Ron: Are your card sleeves damaging your cards? 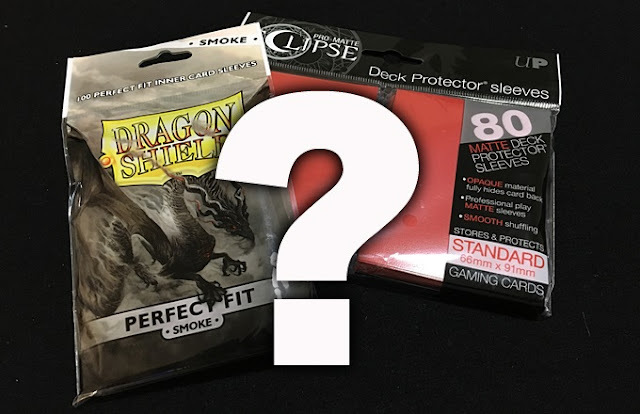 Are your card sleeves damaging your cards? We all put our cards in sleeves to protect them. To prevent damage, wear and tear and keep them in the best possible condition. But what if I told you there is the chance that the sleeves you have your valuable cards in may actually be doing damage to them over time? I thought about this the other day and realized that not everyone might be doing this or even be aware of the potential problem. It concerns the kind of sleeves we all put our cards in. A quick search online will produce a laundry list of articles and videos covering sleeves and all their "important" qualities. Things like overall fit, tendency to rip or tear, how well they shuffle... the list goes on. After reading a couple of these articles, you're a virtual sleeve expert and know exactly what to buy. These things are important, but I want to address something a little less glamorous, but just as important. Let me explain how I got here. When I draw something for a client and I hand the actual artwork over to them, I go through a few things when it comes to caring for it. Keep in mind I'm talking about higher cost artwork here. 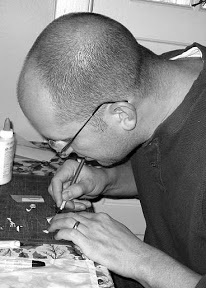 Artwork the client has a considerable amount of money invested in and wants to see remain in the best possible condition for the longest possible time. The things I cover aren't earth shattering, but for most folks, they find the tips to be helpful. Things like don't hang it in direct sunlight as that contributes to fading over time, be aware that extreme humidity changes may affect the artwork, if you're going to frame it, get the highest quality glass, acid free and archival quality paper and make sure the mounting process uses the same quality materials as well. Our cards (at least some of them) can be considered quite valuable. We want them to last as long as possible without getting damaged. But are we storing and playing them with the same precautions as I would recommend to someone framing high end art? And that brings me to card sleeves. Let me be completely upfront here... I don't have any financial interest or gain in either of the brands shown in the picture above. They just happen to be the combination of inner and outer sleeves I use for my cards. The one thing I did before putting my cards into sleeves was to make sure they were what I call "artwork Friendly." By this I mean they they wouldn't be slowly damaging my cards over time due to unwanted chemicals or acids hidden in the plastics used to make the sleeves. Chemicals that have the potential (however small it may be) over time to do oddball things like alter coloring or degrade card surface quality. I didn't want this happening to my cards. I didn't want them suffering a slow death inside a sleeve that was designed to save them from the damage I may be doing to them on the outside. Now before you rip all of your cards out of their sleeves and rush off to buy new ones, take a look at what you have right now. I'm willing to bet most larger brands are already "archival safe" or "acid free" and "contain no PVC" (Polyvinyl chloride). It might take some investigating as it's not the glamorous information that sells sleeves, but if they have these qualities, they'll be listed on the package. These are the qualities you want to see. If you find that your sleeves don't have the listed qualities above, you might want to consider getting new ones that do. Will it be the end of the world if you don't? Probably not. But if you're going to spend a sizable amount of your card collection and you go out of your way to care for it, you should consider the kind of sleeves you use as well. It might cost a few dollars more, but it's a small price to pay in the end if you ask me. IMAGE: Take a look at what you put your cards in, you may be surprised.